Willie Dixon once told Wild Child Butler, "You are the moan of the suffering woman, the groan of the dying man. You ain't nothing but the blues." Here's a man who's been heavily praised by Dixon, Muddy Waters, Howlin' Wolf and Jimmy Rogers just to name a few; a man who those blues legends were proud to accompany. As traditional as the blues on this album are, there's no mistaking a Wild Child tune. They can't be played this way by anyone else - not so boisterous, not so Wild Child. His blues sometimes sound angry and raw, other times soft and country-polished. This release offers a fine mix of Wild Child's down-home acoustic sound, his slow, muscular blues and his up-tempo shuffle or snapping blues. As Wild Child himself said, "If you can't dig these blues, you got a hole in your soul [to borrow from a Jimmy Rogers saying]. Talkin' 'bout sho' 'nuff." 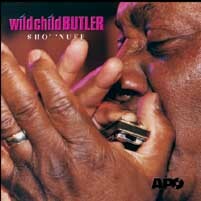 "George 'Wild Child' Butler is one of the last original, hard-workin' delta bluesmen. Although his career started not until the 1960s, the old times' tradition is still clearly heard on his music. You may call it blues, you may call it southern soul, you may even call it rock 'n' roll, but you just can't categorize him to any particular field. There's just one George Butler, and then there are the others." - "Butcher Pete" Hoppula, Wang Dang Dula!...It's Time To Rock'n'rolla!